(Phys.org)—Newton's gravitational constant, G, has been measured about a dozen times over the last 40 years, but the results have varied by much more than would be expected due to random and systematic errors. 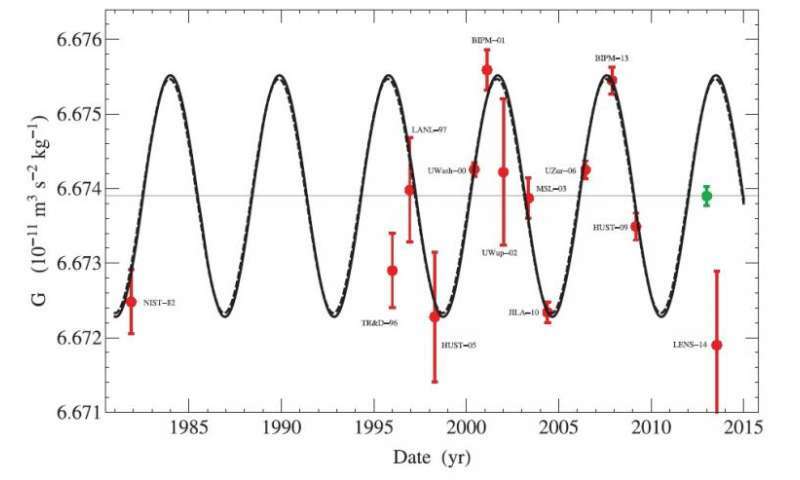 Now scientists have found that the measured G values oscillate over time like a sine wave with a period of 5.9 years. It's not G itself that is varying by this much, they propose, but more likely something else is affecting the measurements. As a clue to what this "something else" is, the scientists note that the 5.9-year oscillatory period of the measured G values correlates almost perfectly with the 5.9-year oscillatory period of Earth's rotation rate, as determined by recent Length of Day (LOD) measurements. Although the scientists do not claim to know what causes the G/LOD correlation, they cautiously suggest that the "least unlikely" explanation may involve circulating currents in the Earth's core. The changing currents may modify Earth's rotational inertia, affecting LOD, and be accompanied by density variations, affecting G.
The scientists, John D. Anderson, retired from the California Institute of Technology in Pasadena, and coauthors, have published a paper on the correlation between the measurements of Newton's gravitational constant and the length of day in a recent issue of EPL. As the scientists explained, the main point of the paper is the finding that, while the measured G values do vary, they do so in a predictable way. "Once a surprising 5.9-year periodicity is taken into account, most laboratory measurements of G are consistent, and are within one-sigma experimental error limits," Anderson told Phys.org. The constant G is essential for our understanding of gravity, appearing in both Newton's law of gravity and Einstein's general relativity. G is not an intuitive concept, and not the same as the acceleration of an object due to gravity, g, of 9.81 m/s2. The official value of G is 6.673889 × 10−11 N·(m/kg)2, but the 13 measurement values analyzed in this study range from approximately 6.672 × 10−11 N·(m/kg)2 to 6.675 × 10−11 N·(m/kg)2, which is a percentage variation of about 10-4. The variations in G are generally thought to result from measurement inconsistencies because G is very difficult to measure, partly due to the fact that gravity is much weaker than the other fundamental forces. Despite the difficulties in measuring G, the new analysis suggests that the measurements are not flawed, but that something in the measurement process varies. One of the scientists' first considerations was that the 5.9-year period is about half of the 11-year period of a solar cycle. Changes in solar activity are caused by changes in the number of sun spots, which affects Earth's atmosphere, and in turn affects Earth's rotational inertia. 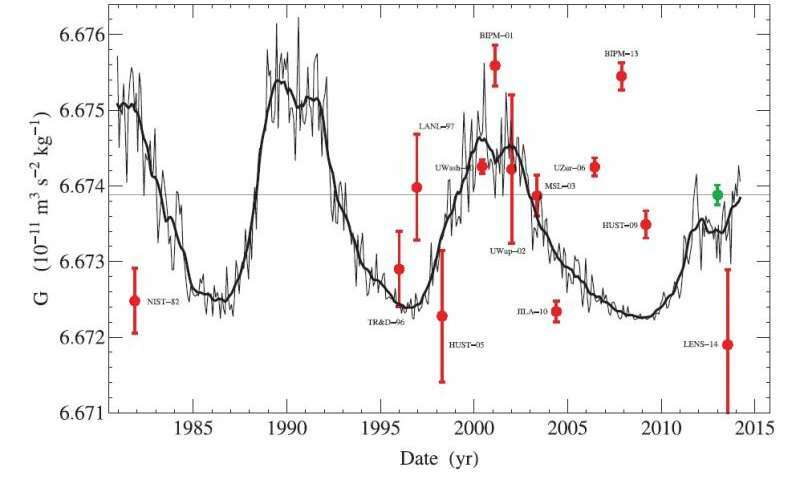 However, a closer look at the solar cycle shows that it does not consistently align with the data on G.
Despite the close correlation between LOD and G, the scientists note that the maximum percentage variation of the LOD is on the order of 10-9, which is large enough to change G by only 10-5 of the amplitude—not enough to explain the full 10-4 percentage variation in G. Since this means that the LOD variations cannot cause the G variations, the researchers surmise that both variations are caused by changing motions in the Earth's core, or perhaps some other geophysical process. Although the results also raise the possibility that new physics could explain the variations, the scientists believe this is unlikely. One of the 13 measurements of G used in this analysis is the first-ever quantum measurement, called LENS-14, performed in 2014. The G value obtained by the quantum measurement is the larger of two outliers in the data, with the other outlier being a 1996 experiment that is known to have problems. Further quantum measurements of G are needed to understand why the quantum measurement deviates from the classical measurements. The scientists are also not fully convinced that the G/LOD correlation is the full story, and they plan to search for other correlations in the future. "We plan to look into the possibility of a connection with the Earth flyby anomaly, which also seems periodic, and perhaps other anomalies," Anderson said. Well, if the photon has weight like M Mathis proposes, and it is not electron bonding but nuclear spin, it would be easy to see that the LOD is controlled by photon spin. So why not measure G outside Earth's inertial frame? Maybe changing G causes changing LOD, with some reduction due to inertia? Sending a spacecraft far out into space to measure G sounds like a good idea. We should keep in mind that correlation doesn't necessarily mean causation. adam_russell also raises an interesting point. Perhaps the correlation has the cart before the horse. Maybe G actually isn't constant. Its periodic variation could be what causes changes in LOD. We clearly need a lot more measurements. This could be a hint of "new physics", together with the experimental lack of the "gravitational waves" current physics predicted. This is the kind of anomaly that research money should be literally thrown at. What I mean is if our ideas of Gravity need adjusting and Time within QED also needs a rethink, some unity could emerge from the analysis as the two are related through GR. If G isn't constant then maybe there is a way to modify it on-demand, within some sort of limited field, this could allow new propulsion technology,etc. Sounds sci-fi, but worth investigating. The G value obtained by the quantum measurement is the larger of two outliers in the data, with the other outlier being a 1996 experiment that is known to have problems. Further quantum measurements of G are needed to understand why the quantum measurement deviates from the classical measurements. In Quantum Theory the act of looking at something changes it's condition. If you measure G you change G, at least according to the theory. Uncertainty Principle. No oxymoron there, it is the measurement that varies not the constant. Track the orbital precession of the planets and see if they have values of G with respect to the Sun which oscillate on some time scale. This may require a new space observatory or two or three to make very precise measurements of every planet's orbit as often as possible. The idea is to see if G varies every 5.9 years, causing the planetary LOD change and presumably and orbit change, or if the LOD change causes us to measure G differently. Presumably they sould all oscillate at 5.9 earth years if G itself changes. If the planet is what causes the apparent change, then each planet will have a different apparent change in G.
If you could lower G on demand for a small volume of space, then you could launch space-craft into orbit or to other planets for a much lower fuel cost. That's why I was interested in a variable G concept, which may well be the case. Maybe the magnetic field, which is also linked with the LOD, can modify G somehow. Looks like the oscillation is synchronized with the half-orbit of Jupiter. Looks like a reverse hockey stick. Global warming? Saturn is in a 5 to 1 resonance. Divide Saturn's orbital length by 5 and you get 5.89142...again an exact multiple of a whole number. So the orbits of the two largest planets are in whole number resonances with the oscillation in the value of G.
Neptune has a whole number resonance of 28 to 1. Uranus does not have a whole number resonance, which is not surprising to me because Uranus has different historical characteristics and rotational axis. So yeah, I conclude that G literally does vary on a 5.9 year cycle, and this cycle controls several orbits and rotational phenomena of the planets. Uranus is different because it was somehow created by a different process, or was hit by something very large and moved out of the natural resonance. But for contemporary physicists the space-time density and speed of light remains constant even inside most curved & dense gravitational lens - which is an apparent nonsense, because the refraction couldn't happen there after then. Where the speed of light remains constant, then the refraction index must remain unitary and no lensing may occur there. Flawed interpretation, Zeph, since lensing occurs. It's possible to describe it phenomenologically as an index of refraction, e.g., n = 1 - 2U/c² where U is the gravitational potential ( cf. http://www.marcol...l-lenses ), but the lensing is achromatic -- a difference in photon energy (wavelength) has no affect; only the distribution of matter doing the lensing has an affect. Which maybe makes sense when you consider that if you were to drop a feather and a bowling ball from the same height above the moon, both would hit the regolith at the same time. Pluto is almost exactly 42 to 1, and is closer to a whole number than is the planet Uranus, which is 15.93, the farthest from a whole number of any of the 5 planets I've tested so far. I wonder if whole number resonances to the number 5.9 years appear in other star systems orbital and rotational characteristics? That would be the smoking gun. The numbers in our own solar system might be coincidence or some sort of internal only resonance, but if the same number appeared elsewhere it would be a universal constant/law involved. It is indeed astounding that measurements of these types of data and at this level of exactitude are able to be ascertained. While it certainly seems that the LOD and the G variation are a result of a common cause, tracking down this common cause will be subtle. If only that thing you say was the truth Skippy. Cher, you ain't never concluded anything in your life. Why do they vary so much? Because large heavy objects in closely parallel universes are coming close to ours and causing gravitational wave to leak through the barriers. Its already been demonstrated in the colliders. Drops of matter poke though, its no problem for energy. So as objects move around in other universes, they bang into the borders and gravity comes though. Its also where the missing matter is located. Which (42) is also the answer to the meaning of life. It all starts adding up full circle. Hello Zeph so 'docile' is your new pseudo or, should I say, pet name. Anyway it fits you real good; it sounds really friendly and makes me feel like throwing a bone at you. For the next time that you will change your pseudo (because one day or another you will change it, I know you.) may I suggest 'worm' this would fit you really good too. Note the error bars. Some are almost as big as the total cyclic variation over the years. In short, the oscillations might not even be there. Also, 3 of the data points don't fit the graph, even within their error bars. What if lowered G causes the Earth to be a bit more loose? Wouldn't i expand a bit, increasing its diameter? To conserve the rotational momentum it would roatate a bit slower then. Wwhen G rises, the diameret shinks, rotarion speeds up and the day become sorter. This should also happen to all celestial objects we observe - so we should measure it. And process the numbers. This might be something else that G itself. Something we don't know of. Then, quantum measurement gives The G while classic measurements give G modified by some - let me name it - Dark Coefficient. Which might be trivial when finally found. Jupiter:Orbital period 11.8618 yr divide by 2: 5.9309 years. Why are you dividing by '2' & '5'? You can't just go around diving by this and that number just because it suits you must have a reason. How about this one. The article quotes '...5.9-year oscillatory period of Earth's rotation rate...' choose a well known math entity, exp(5.9)=365.037..No, the dimension is 'years'; or(5.9x365.256)^0.0625=1.615625..close to the Golden ratio (days) want some more? You can fit the data PERFECTLY if you use a sine wave with a varable wave length. My writing this proves I know very little. From that it is again easy to figure out what every one else knows. If gravity changes, why would you assume a constant rate when vatiable rates are infinit. "Despite the difficulties in measuring G, the new analysis suggests that the measurements are not flawed, but that something in the measurement process varies." If we really understand gravity with known physics instead of these bizarre theories we might know that the gravitational pull changes even faster than we can detect. Suppose gravity can be explained using superposition. Consider the neutron as a contained electron-proton, then replace mass with a particle count, i.e. M/(me + mp). Follow this with the location of the center of the negative charge distribution at a single point in time. Next locate the center of the positive charge distribution. Due this for both masses. Note the total centers for two masses may be outside the body of the mass. Now calculate the expected rate of change for the center of the negative charges and also the same for the positive. Note that this measurement becomes the sort of measurements made using quantum mechanics. Now define how this measurement may change with spin. Note the distance between the two charge centers and compute the coulomb force between the two superimposed dipoles. The charges will comply such that the like charges are father apart than the unlike charges. So a model, a rectangle within plane. Never mind that all centers do no lie within the plane, a transformation exist such that the above will give a measure of the expected distance between the positive and negative centers. Hence, since we are unable to actually define the location or arrangement of these centers, the distance within the model has dependencies no one has ever studied. Hence, the PhD physicists teaching GR, BB, SM may spend time trying to recapture Truth instead of looking for the unknown to explain the error of our ways and theories only in our minds without empiricism. Hence, Newton related m based upon the measure of g, self referent, no definition for mass, only close to the particle count and the coulomb forces of the all the charges, and there are a lot of charge. It would be inane to dismiss the effects of so many charges. The superimposed dipole is a different "animal" than the real dipole; hence, reconcile the radiant field and see the interaction of all particles relative to speed and location of other charges. The relative wave-front of each charge relative to each surrounding charge may have any speed,velocity and shape. Also see that only a proton and an electron has a stationary reference frame that is well defined, or properly derived from the evidence, and assumed. The continuity of the existence of these particles is simply a mystery and exactly what these particles are is a mystery. For we have no other definable evidence, theory is not evidence, evidence defines the theory. So, may the distance between the two charge centers, definable by any plane of choice, possibly be modulated, i.e. a group response upon "charge bundles?" defined by superposition. So what is a better definition of the mass equation for gravity ---> the particle count and energy, i.e. the dE/dt and it's curl, etc.. Did we use proper hindsight? Evidence of a modulated field? Simple interaction! Simply from small numbers to very large numbers and the possible modes! Then "Nature" becomes our creations, only if we fully understand! I thought the science was settled on gravity? Is there enough evidence to settle anything, looking for the unknown to give credence to something that does not match the evidence, probably means you're looking from the wrong perspective for why? Settled? What? Exploration is not a science, it's an interest. We shouldn't give Nobles for "probability hits" that match an idea, rather than a measurable and empirically defined Theory, Placing theory before evidence is invalid. Newton was true to his measure, even though he also had some other exploitative thinking, he relied upon Logic. According to climatists, there is. They declare the 'science is settled' on climate change so shut up. Take away any degree in physics that accepts GR, the discontinuity between reason, mathematics, known physics is obvious. Momentum then is d(mr)/dt. An absurdity. It does not translate mathematically due to a vector space being treated as a scalar with a false shell of some sort of rest frame and ... representing motion, undefinable in space and time without introducing 1. New Logic - Not defined 2. A new mathematical space totally translatable - momentum has not been shown to be a function of displacement. i.e. no evidence. 3. if motion of heavenly bodies then all values change as the distance and direction of motion. The later is actually true for waves but is not the intent of GR. Thought experiments or the thinking of the insane? The scalar distance field is within his equation and not defined as translatable to Newton, known... ignore??? Or you can say the space wrinkles, reminds me of book when a kid, "A Wrinkle in Time", probably inspired by this enchantment with GR. It is sort of hypnotic! Then you think, Michelson and Morley, looking at their own reflections! Is this how this got started? It is really funny! Like watching children grow up. Oh, I see myself, then begin giving power to the reflection, subjectively. Compare the expanding Earth theory in the light of already known increasing of length of day from prehistorical times. In the precambrian 500 million years ago, the day was about 22 hours long. 1. The lengthening day is due to tidal friction from the Moon, and to a lesser extent the Sun, and to a microscopic extent the other planets, primarily Jupiter. This is technically called "Tidal acceleration." No expansion of the Earth is required. 2. I checked and it looks like your figure for the Precambrian is fairly reasonable, for the Late Precambrian anyway. So why the modulated G? We see the effects of g but why the effect upon G? Is this an interaction of gravitational fields affected by spin or like polar drift upon molecules, i.e. the superposition of the location of the center for the electron cluster from the proton cluster. Maybe definable by superposition and a necessary field capable of creating the discrepancy. A new measure. |p+-p-| and the electrodynamic-engine that drives G. A logical conjecture. It's sorta like explaining quantum mechanics to chickens. Obvious to me; however, chickens are only concerned about the manufactured corn. Wha...? Are you callin' the rest of us "chickens"? Ignore him. Hes a religionist. Lingering questions is proof that god exists. Only if you believe the nonsense of modern physicists. Stay with Rutherford, Maxwell, ..., common sense! Else continue eating the corn. Start here and then corrupted connotations as well as annotation to look for God. The surface of the Earth is not an inertial frame, because the Earth is rotating. There will be a centrifugal force on any instruments measuring G at the surface and this force will vary with latitude and the rotation rate (LOD). A component of the force will oppose the force of gravity toward the centre of the Earth, effectively reducing the value of G in a way that follows the LOD variation. The measured value of G would be higher when the rotation is slow (long day) and G would appear lower when the rotation is fast (short day). Nice try, consider the rotation and affected field of a very, very, very large group of charges, before I listen to any other explanation as relevant. Give me a proof of why this would Not have an effect as well as what G actually represents, some constant for a given state of a bunch of charges!!!!!!!!!!! really, are we still doing this? Is this a thing? One would think the young would grab this obvious information, pick an element, a given cosmological cluster, mathematics of aggregate particles, or redefine the quantum with a much better description and properties, i.e assumption with only two elemental parts and a 4D deterministic dimensional description with stability analysis and allowed deviation stability over space and time. Are we boiling in 4D and what are the allowed deviations. Wish I had the time to start over when I wanted to major in physics so that I could understand what the heck Einstein was writing about. But I didn't need a PhD, only an MSEE to earn an honest living. It is all calculable, especially with high speed computers which are about to take another leap. And GR is one of the best magic tricks of misdirection ever played upon the mind. So an accurate 4D description is required to see any influence upon our space-time. Just think, relative ripples based upon location and relative motion of charge. Michaeltfrench's answer covers the issue of inertial frames- it's important to remember that if you feel gravity, or acceleration, you are not in an inertial frame. it's clear you must know the two masses m and m', and the distance r, and then measure the force F(g) to find the gravitational constant G. The first attempt to measure G was a series of measurements by Henry Cavendish in 1797 and 1798, reported to the Royal Society in 1798; the original apparatus for the measurements, consisting of a pair of heavy lead balls attached to a torsion balance, was conceived sometime before 1783 by geologist John Michell, and the balance was built by 1793, but Michell unfortunately died before he could complete the experiment. The equipment was passed on to Francis Wollaston, who passed it to Cavendish. Cavendish was a meticulous experimenter, and succeeded in his measurements; his actual goal was to determine the specific gravity of the Earth, and G never appears in his initial reports, but its value can be derived from his measurements, and even with his relatively crude apparatus (by modern standards- it was phenomenally precise by the standards of the time) he was able to get a value within 1% of the current measured value. His accuracy was not surpassed for nearly a hundred years. G is actually very difficult to measure precisely, primarily because gravity is such a weak force, and even far away from Earth's influence, measurements would be disturbed by the other planets and the Sun. Since spacecraft are very expensive and it's very difficult to conduct a large experiment, we're more likely to get a more exact value in a laboratory on Earth's surface than in space, unless and until we have a permanent habitat in space where lab experiments can be conducted. So, RichTheEngineer, the main answer to your question is that it wouldn't help much if any at all to measure it outside the Earth's gravitational influence (which is what you were really asking, your minor terminology error aside), and it would be extremely expensive, for little or no gain. The product of the Earth's mass and the gravitational constant, GM(earth), is extremely well known, since it is measured by every satellite in orbit. But separating the two is very challenging. This is so cool! I had no idea this was even a thing. I wonder if this oscillation is enough to have an impact on life at the molecular level, and if so, would deep space missions need to have this oscillation in artificial gravity to maintain astronaut health? Gravity is so weak that it's extremely unlikely to have any impact on molecular biology; gravity is routinely ignored in high energy particle experiments, and in all of quantum mechanics, since there is no theory of quantum gravity. For example, the effect of Earth's gravity on the paths of the particles in the LHC is microscopic; the other perturbing forces they experience are far more important and the design of the superconducting magnets that focus the beams and control the paths of the particles can very nearly ignore Earth's gravity at energies on this scale. I went looking for a reference, but it's not in my link library and I couldn't find it online. As best I recall an article I read some years ago, the influence of the Earth's gravity on the beam path of the Fermilab Tevatron is on the close order of nanometers for each pass around the main accelerator ring, far outweighed by the other perturbations that the superconducting magnets have to correct for to focus the beam, and it's likely to be a fraction of that in the LHC at its higher energies. I couldn't find any indication that the Earth's gravity was allowed for in the design of either accelerator. BTW, worth mentioning that the G in Newton's equation for Universal Gravitation is the same G as in Einstein's General Relativity. Einstein's theory supercedes Newton's, but only at high energy/high gravity and over very long periods of time and long distances; over short periods and distances, and at moderate energies and under moderate accelerations or gravity fields, they give results that are essentially indistinguishable. Only a very few satellites with special requirements, like the GPS satellites, or Gravity Probe B, or the GRACE mission, use anything but Newtonian gravity to calculate their orbits. The extra precision of Einstein simply isn't required for ordinary space missions and there's no point spending the extra time, money, and computing power on it. The most significant difference in the Solar System between Newtonian and Einsteinian gravity is the orbit of Mercury, whose orbit's major axis moves some 80 seconds of arc per year that Newton's TUG can't explain. The reason it only appears in Mercury's orbit is because only Mercury is close enough to the Sun for the difference in Newtonian and Einsteinian gravity to be evident. Gravity, of course, being an inverse-square force that drops off as the square of the distance. Over periods of millions of years, the difference becomes evident in the orbits of the other planets, but since we haven't been around that long, we're not old enough to notice them in our measurements yet. Why do you use a macroscopic measure for the elemental? esp. one with very poor empirical data without causal affect? Why do you use a macroscopic measure for the elemental? What's that even mean? The Newtonian formula properly describes the orbits of all the planets but Mercury on human life timescales. What's "elemental" mean? Seems pretty "elemental" to me. esp. one with very poor empirical data without causal affect? Empirical data other than the orbits of the planets and comets, you mean? You do realize that Newton's TUG was confirmed by Sir Edmund Halley who predicted the return of Halley's Comet, right? Looks causal to me. Maybe you don't know what "causal" means. BTW it's "effect," not "affect." The first is a noun, the second a verb. Given you can't even separate the parts of speech, how do you expect to understand basic mechanics, never mind God? Tell me, rufus, are you a flat earther? Do you "believe in" nuclear weapons, satellites, and particle accelerators? Or do you think Jebus makes them all look like they work? Do you even believe in skyscrapers, or do you think they're all lies by people who "hate Jebus?" Where do these fools spawn, is what I wanna know. And how do they eat without sticking forks in their faces? rufus, dude, can you even count, or do you think that's an invention of Satan? An affect generates an effect. However, correcting grammar is a poor argument and is unrelated. So with your great knowledge and understanding what did we communicate with a not so obvious correction. Instead, speak to the point or make a point. An affect generates an effect. Dude, you just used affect as a noun again. Seriously, did you graduate third grade? That's when I learned the parts of speech. Not to mention, you appear to think Jebus is holding all the atomic nucleusies together. You are an uneducated fool and you make Jebus and the Babble look like crap as a result. You should shut up and read, and maybe you'll learn something. Even I have more respect for religion than you do. And I'm an atheist. BTW, affect can be used as a noun- but its meaning is, the expression of emotion by actions. Rufus, I don't think planets, stars, and comets have emotions. Just sayin'. OK, I get it. Let's use a wrinkly space wither grammatically and mathematically possible and include grammar as causal and do it just because ... Which logic from "What's the Name of this Book" by Smulyan. Check my spelling of the author's name then tell me witch logic you find acceptable? Include what is pertinently classified as to degree by using a causal actions defined by the acceptable response such as will define gravity forcing you to accept! Dude, you can't even spell "which." What attributes of this unknown "thing", affecting acceleration, we call mass ... wait on it ... ahhh, Maxwell, where were you when the puzzle was first mentioned; show us how this gravitational "effect" may be "affected" by the constituent elemental charges and other bodies of charge. i.e .mass? I love this idiocy, it keeps me sharp, to see absurdity as possibility or the thoughts of fools and wise men. Please, more nonsense. I'm building a journal, online. Those who parrot popular "thought" may be educated; however, without any originality allowed while eating this manufactured corn. Better off, ignoring this regimen. Which of these things do not belong within the set of sane thought? A wrinkled space, i.e a conceptual frame of measure as affecting ... or an effect of a bundle of charge? Maxwell, where were you when the puzzle was first mentioned; show us how this gravitational "effect" may be "affected" by the constituent elemental charges and other bodies of charge. i.e .mass? LOL, Maxwell's equations deal with electric charge, not gravity, dumb da dumb dumb. Seriously, rufus, you're making Jebus look bad. Really. Religion for the duh ummm. You know, rufus, there are Christian physicists who don't deny relativity. Maybe you should talk to them. BEFORE you post on the physics site and make them all look as dumb as you are. As far as I understand, these G experiments do a lot to eliminate the influence of Earth's gravitational pull. So any variation shouldn't affect their results. One can always do a fit to variation, and in fact it is an all too popular pastime. But it amounts to data fishing, so would need a 5 sigma test whereas 3 sigma uncertainty suffice for a simple measurement. And since it injects extraneous parameters, it would need testing of its mechanism indeed. Well, we will see if this becomes fruitful. Meanwhile, the cherry picking of data, the attempt to predict variation that is on the order of the uncertainty in some of the experiments, the having of a retiree and a "private researcher" on the team, and the interest in similar variation elsewhere (the so called "flyby anomalies"), do not lend confidence. Well, they do the best they can, and the variation isn't *that* big. Else, you do not have a frontal cortex of an evolved specie; in other words, you exist among those creating a new bias called "specy". A flock of fools, or is the term "tribe" and one incapable of domestication with so much erroneous thinking, i.e. flawed logic, self worship, ... without attention to their Masters, Rutherford, Faraday, ... No, they think we shall ignore these Truths and instead "accept" magic as our theoretical foundation even though it is unproven, i.e. defined. I prefer "Flock" ... Really! I would tend toward the view that the LOD variation and G variations, if these are not in fact random systematic errors, are effects of a common cause, rather than the LOD variation causing the G measurement variations, because of the method mostly used to measure G, which tends to exclude Earth's gravity. Rufus, now you're trying to pretend science is a religion, and that's not going to work either. We've all seen that one before, and it's been thoroughly and embarrassingly debunked many times. Suffice it to say that science goes where the evidence leads it, whereas religion is just made-up fairy tales about jealous super magic daddies in the sky. On edit: Well, the "big three" religions are, anyway. There are some out there that are less nutty, but push on just about any of them and you're going to find a fairy tale at its core. No, there isn't. You appear not to understand the difference between equality and equivalence. Ok, except the self reference, using the measured thing to described the measured thing, is only acceptable with a correctly defined feedback loop, or a fractal space. i.e. Not classical, define your logic. Don't see where that's happening. Remember that GM(Earth) is well-known from satellite orbits. We know F(g), because the orbit is dictated by it. We know m', the mass of the satellite, because we built it. We know r because we can measure the satellite's orbit. What's left? Gm, AKA GM(Earth). What, slugs and grams, what? These are assignments not the other way around, we named this measure, get it? We did not have enough information to define more than just a name not a causal effect. So if you know what you are describing, why do you need G? We already have 1 constant. What tha ... he asks. Dude, now you're denying Newtonian gravity. I only see one constant. Please point the other one out. Here's an idea, put this wrinkle in space and match it to what we see with the perihelion of mercury, not the original calculation, but an updated calculation with another freaking constant to match the expected. Really? Are we cod? Your denial of the obvious is well played, you be Tweedledee and and I'll be Tweedledum. Anyway, please define your variable space as it relates to your measure. If we continue playing this game we will be denied to write upon this site eventually. So, I must excuse myself, in spite of this joy and laughter for a skit on SNL. I note you can't point to the "other constant" you claim exists. As usual you make claims that are untrue and when challenged you try to deflect the conversation away from your FAIL. Rufus, you should be asking questions, not making assertions. You don't know enough to make assertions. Not knowing is fixable. Not wanting to know is not. Still waiting for the "other constant," rufus. Both masses are variables, rufus. The equation has to work for any two masses, any distance, and will yield a force for those masses at that distance. i.e. the house, the physics required to build the house, and the trees, all have different attributes than the house. The idea that a tree molecule has tiny little amounts of homes in them maybe the potential but not the house; ludicrous. The unit measure house, or mass depends upon us, the earth, the instrumentation, but we still have not defined the constituent parts of the mass, as nothing but more mass, and tinier and tinier amounts of mass, really!?? Bend space???!!! What the hell are you talking about, please, expound with more than ridicule! Is this not a revelation of the obvious? Measure the amount of the + and -, sum it up. Create a dipole with any orientation and motion, may you then approximate gravity as a function of the distance between these superimposed charges? Clearly, yes. Now would the like charges be closer together than the unlike charges when measuring a single instant of these two dipoles? So do you need a wrinkle in space? But the mass doesn't. You can choose any unit you like as long as you use consistent units for all masses, and units that are dimensionally consistent in the rest of the variables and constants. Rufus, if you don't understand algebra no amount of weaseling is going to get you out of it. The second constant, rufus. Still waiting. So what the hell is m in your equation and how does the m relate to G? What's the physics of your allowed deviation due to the surrounding fields and all elemental particles? Do you have data supporting your interpretation? Do you have a theory defining what causes the measure and the deviation. Or do you simply define the deviation as dark? The darkness in your head! For example, we could use force in pound-forces (lbf), mass in pound-masses (lbm), and distance in feet, in which case the value of G would be feet cubed over the quantity pound-masses times seconds squared. The results would still be the same. And the equation is still the same. And if you convert the lbf force to Newtons, you'll get the same answer as if you use Newtons, kilograms, and meters. You need to point to the second constant, rufus. You're not going to divert me. I suggest you admit you screwed up and there is no second constant. You're just making yourself look stupider and stupider by trying to avoid reality. So what you are saying is that G is changing because the space is wrinkling periodically causing the mass to vary periodically and a constant that is not a constant, or a mass dependent upon what? Your changing measurement as the reason for the change? The work required to identify the modal response of a "mass" to any field ... forgot, we just started to collect data, never mine. You are not caught up! No, what I'm saying is G doesn't change. Our measurements of G are of limited precision, and therefore of limited accuracy. The measured value therefore fluctuates, depending on imprecision of our measuring techniques, systematic errors, and (allegedly, according to this article) some unknown minor fluctuation that we have not yet discovered. The article does not provide evidence that there is, in fact, any actual change in anything but our measurements. This could all still be a statistical anomaly, as Torbjorn pointed out above implicitly. Not only do you not know any physics or any relativity, you also don't know any measurement theory. "unknown minor fluctuation that we have not yet discovered"
is your science not mine! Theory, allows precision. Theory, using the unknown to define the known, and not applying known science is .... please explain! Theory does not define constants; these are empirical values determined by measurement. Theory defines the equation(s); measurement defines the constant(s) in the equation(s). As you would know if your understanding of science was above the third grade level. Meanwhile, still no second constant, and more attempts at obfuscation. Meanwhile, note that the article is, in fact, about measuring the constant. I should be thorough: in fact, deeper theories might define constants in earlier theories. This is actually an issue in current high energy particle physics. Scientists are always asking "why" and some constants' values have been defined by deeper theories; but the deepest theories, which define things like α, the fine structure constant which defines the strength of the electromagnetic force, remain unknown. The value of G is one of these unknowns; the only way we know to find its value is to try to measure it. That's why the measurements described in this article are so important. With a really good value for G, we have a value to shoot for in any proposed deeper theory, which might unify gravity with the quantum forces of the SM, and help us find a final theory of physics that shows why these constants have the values they have, as well as a quantum theory of gravity allowing full unification of the four forces of nature. So that's part of why we measure constants. Then replace m with the equivalent q/m, use m= me + mp, also modify your constant epsilon zero with the unit "Kg or g", i.e. remove mass from the mathematics. Now compute an equivalent set of dipoles, using the known measure of distance and the properties of charge and motion and explain to me, which constants you are talking about? You may set a minimum distance apart within each mass, relative to another mass and simply set "d" to a constant, if you are lazy; but, are we also within a field? In other words, what are you talking about, an unknown reason? Wow! What are you smoking, gimme som'a dat! It is also relative to scale, gee, what magic visions you must be having! Don't forget the magnetic field and the location of the poles, include its present change, space, whatever, create a response to a calculable charge distribution, but not some new physics to explain your laziness or some head trip. Still using G, that's funny, it should be changing. Relate, everything is changing except two little particles, a swarm of them, no and ocean of them. try a planet of them, G? What are you really talking about? A change with some kind of relevant measure of your reflection upon this field, well almost, the absorption rate for humans is beginning to slow down, but the quantity is up. Blame that motion. say anything; except, "I don't know why this measurement is changing? Or maybe our precision, or ... it is changing! I would say that is understood, really? It should be changing, its not a constant, it's a result of the idea of the measure of mass, a mildly dynamic interaction among matter, and so on.. may be included, but then you need real science, which leads us to this idiotic conversation the correct expression for gravity as one without an external/improperly defined force of nature, due to lack of information. Simpletons! Still no second constant, rufus. Go back and do third grade again. Why? We're not dealing with electric charge, only gravity. Why? α doesn't change. c doesn't change. Why should G change? They're called constants for a reason, duh. Visualize: seeing the magnitude of a collection of like things, with a defined symmetry of the whole, i.e. atoms, molecules, the stationary field, dynamics, that which causes motion of the centers, stable or unstable "masses" as only groups of charge, any group … just see it, in your head! Then you may understand as a function of scale without ever using the unit "mass"! Want a transformation, note the limitations into your way of thinking. Why would anyone argue with an engineer about his measurement. I would give him that data as he walked through the door. i.e.what are we talking bout, an insult. This definition is more holistic, the math is the same; however, the initial conditions ... I'm wasting my time, you will never see the continuum, lucky it takes intelligence to distort it, ugh BB, what you get mathematically has much greater dynamics once the transition to q from m is properly applied to a four dimensional space. You are blind without it. Holism is irrelevant. Physics equations are independent of the background; that's why they're equations, and not recipes. And you still haven't pointed out the second constant. FAIL again, thrice. Define, in 4D, from a zero ref frame of an electron with and without interaction, just this simulation ... this is the 21st century, we should be able to reach anywhere in the universe within a century. Sooner with cooperation instead of the BS in Washington and the rest of this crazy world. If you need more information, hire me. Why? I don't see anything there that has to do with gravity. You're talking about electrons, and that's quantum mechanics, and there isn't any quantum theory of gravity. This is, again, totally irrelevant to the gravitic constant, G.
You're deflecting again and FAIL. that define how forces work? See anything tough there? Notice how simple they are? That simplicity is the work of genius. That's why Newton is famous, and you aren't. Would this be an anti-particle? Isn't this rather obvious when you see it with 4 orthogonal lines, a sort as, I see 3, I see 4, and now we have new quadrants! Are they all real? some are verifiable and we got that new science you been looking for which is not new at all, it's like you and them, all 'been still eating the manufactured corn since the 20th century. Want the complete theory,stop the BS and negotiate. T$, question is it possible to 4D-invert which properties? Inverters build super-computers. Then there are matter transformation, energy transformation,optics, ok, ok, most of this is well defined, "just beginning decent plasma experiments, but the insight! Opportunity, if you do it correctly. But I think the new supercomputer "gets it" already, necessary delays, with few concepts not applied. Anyway, my insult, I'm not too good at this; but, you don't even appear to have a mind or you are and intellectual property thief. I've already publish the basics but not the later. So good luck with G.
Anyway, to address G, show the distribution of the center of all rotating matter (mass) traveling around the sun, also do a total center of gravity relative to the earth, just a conjecture .. It's just those anti-gravity engines of the aliens that keep messing with the measurements. You kinda sound like Reality Check... or JVK. @Whydening Gyre & Da Schneib if either of you are American then you'll know more about this idea than I do; Isn't Rufus Warren and American Football Player? Separating with a 'g' (gravity) might explain where rufus 'is coming from'. When I looked at rufus's '...show the distribution of the center of all rotating matter...' thinking of Parallel axes theorem and Papus along with astro perturbation theory, it reminded me of a 'game plan'. Maybe just my warped sense of humour! thinking of Parallel axes theorem and Papus along with astro perturbation theory, it reminded me of a 'game plan'. Don't know what a Papus is, or astro perturbation. But David Bowie sings - "It's no game..."
Maybe just my warped sense of humour! Thanks guys. Multiple formal papers have been rejected, i.e. needs more work. Moe work? Maxwell needs more work? Really? I'm demonstrating what is bullsh*t. I show the speed of the wave front of light is obviously from -infinity to +infinity, common sense. I show a calculation, irrefutable, for the force of gravity. Rejected. I show how to compute attractive and repulsive forces in molecules, attraction is the big winner at distance, self assembly, repulsion plays only upon stability during a forced containment, .... No buyers. I'm leaving earth pretty soon, so I thought I would blast what I see. Well, not leaving, being absorbed, burnt, and recycled after death, maybe. I won't be there to validate my wishes. So be careful, present beliefs in theoretical physics is more of a religion than science, its all about the unknown. This is what the unknown-known looks like. Only paper required is the lack of it. I played football in high school at 140 lbs, in 1965. I was so small, I was always busted-up. But I was stupid enough to get back up and get busted again, and again. Became the model of courage for all the players. (Present thinking-Really? High School!) The coach took me on the road with the team even though I was on crutches. Did not ever get into a game. So not the star "Rufus" of the Mississippi Bull Dogs but an NCA&T Bull Dog where I never played sports. Diff bulldogs and diff Rufus. I'm prettier! Present theory has as much science as what was used to a pass law, marijuana made illegal. Test what people are telling you and what you think is the correct measure based upon reality not bias, emotion, or misguided thinking. An old hippie theory, mine. Thanks guys. Multiple formal papers have been rejected, i.e. needs more work. Moe work? I show the speed of the wave front of light is obviously from -infinity to +infinity, common sense. What is the basis of that statement? I show a calculation, irrefutable, for the force of gravity. Rejected. As an artist - I know rejection... That would be an interesting calculation, but I want to know why you feel it to be irrefutable? Is there such a thing? I show how to compute attractive and repulsive forces in molecules, attraction is the big winner at distance, self assembly, repulsion plays only upon stability during a forced containment, .... No buyers. I'm leaving earth pretty soon, so I thought I would blast what I see. Well, not leaving, being absorbed, burnt, and recycled after death, maybe. I won't be there to validate my wishes. It's ALL loops. Notice how everything (within this galaxy, anyway) is corkscrewing it's way through space? Do you exist? This not a puzzle, relative to me that I think is common sense. If you can't see that you haven't learned, "How many blocks are there?" Really? Did you not get this before you got your graduate degree based upon someone's stupidity or the stupidity of the whole. Yea, we can define rejection, just be specific. I don't care, just my 0.02 apprx. of 100/1 ie Value of a dollar relative to the value of a: penny is getting bigger. Was this weird or what? Relative to what? No assumptions! Traceable information and mathematics is a description of itself, we don't need to try to redefine Maxwell. But, there exist a better description, the 4D space is definable empirically without any assumptions. A Four dimensional representation of the singularity, +/- charge! I think good software should be able to converge. At least we get that fit to known theory of the singularity. We know that! time and space same thing, all mapped to any lambda nu or lambda T ..
Space and the fields and or observation point as any point or just our 3D or frame" blah, blah ..
You could then use another constant of iteration, a dimension of time, or a dimension of space, using any initial configuration based only upon known physics, i.e. precision! So why not pick the loop! In other words, predict the value of your misguided measurement! That was a quite a conversation you just had with yourself, there. Great wisdom, let me out of this rabbit hole.